This year for my birthday I decided to tackle one of my all time favorite cakes, carrot cake. 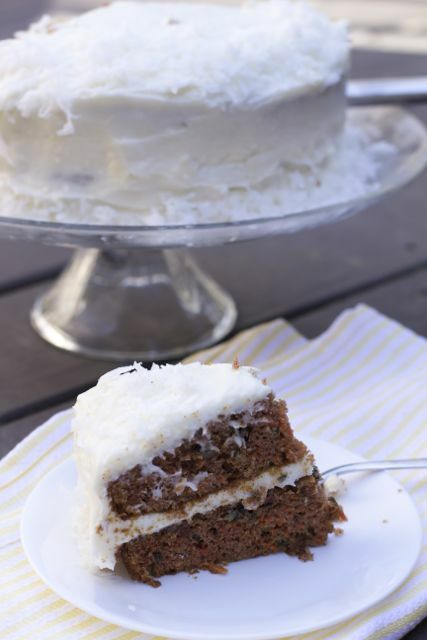 There is something about the spicy cake smothered with cream cheese frosting that makes my taste buds smile every time. Not all carrot cake recipes are created equal. I don’t like raisins and pineapple in my cake so finding a recipe that keeps the cake moist is a must. If it was up to my kids, I would just serve them a bowl of the cream cheese frosting and they would be satisfied. My family is more traditionalist and prefer chocolate or yellow cake. They were not that thrilled at first when I made a German Chocolate Cake for my birthday last year. 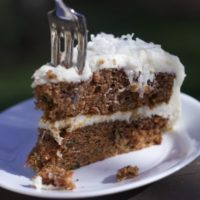 Next time you are in the mood to make a cake, branch out and make this ultimate carrot cake recipe, you won’t be sorry. Since it was my birthday cake, I elicited my youngest to help make it. 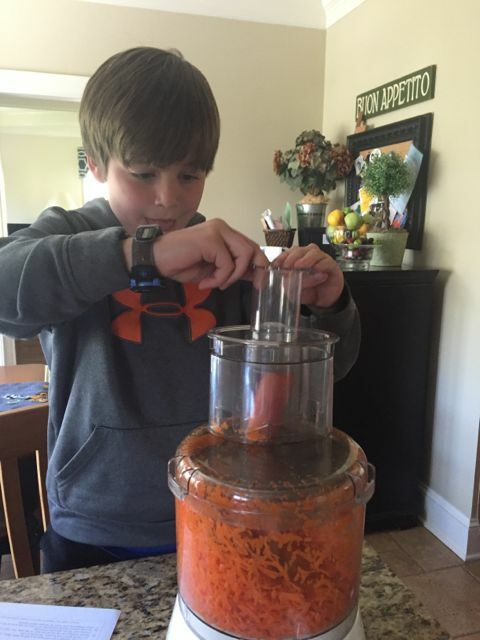 He was on spring break and he loved grating carrots in the food processor. Don’t you just love all the fresh ingredients that go into a carrot cake recipe. The bright orange carrots and the crunchy nuts really make this cake special. I used two 9 inch cake pans to make this carrot cake recipe. The batter is thick but it puffs up beautifully in the oven. Can’t believe I did not have a picture of the cake before it was frosted. But you get how to frost a cake. 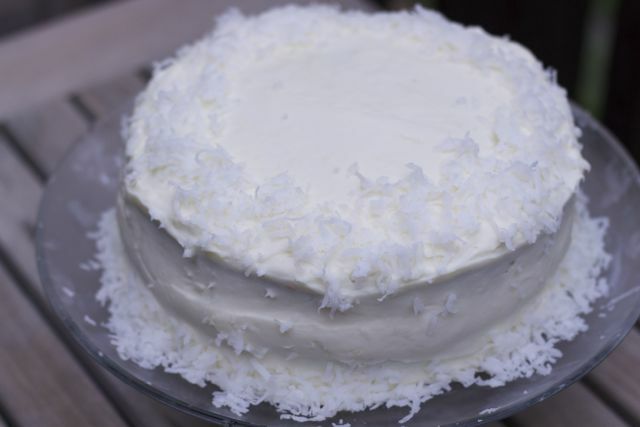 I decided to add a little coconut on the outside of the cake instead of inside. Really just for looks if anything else. 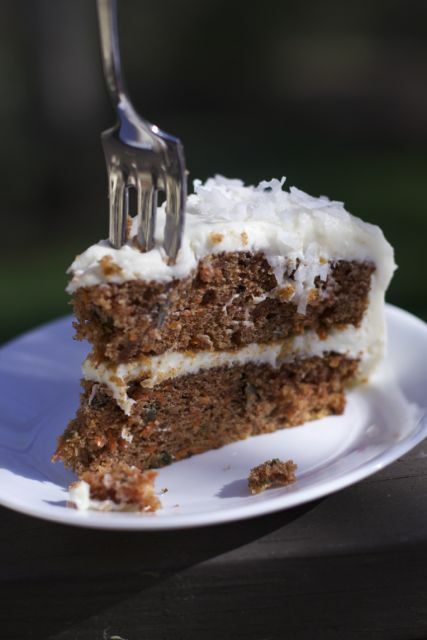 Here is a slice of this delicious and hearty carrot cake. This recipe made a generous amount of cream cheese frosting so it is loaded with that extra sweetness my family loves. I know you are ready to take a bite aren’t you. Carrot cakes are filled with veggies, so it’s healthy right? I love a cold piece for breakfast too! The only Carrot Cake recipe you will need. Of course unless you want to make these Carrot Cake Cupcakes! Preheat oven to 350 degrees F. Line bottoms of 2 9" cake pans with parchment paper and spray sides lightly with baking spray. Set aside. In a mixing bowl, add the flour and baking soda and whisk to combine. Set aside. To the bowl of a stand mixer, add oil, sugar, applesauce, salt, eggs, and spices and beat well. Slowly add in flour mixture and beat to combine. 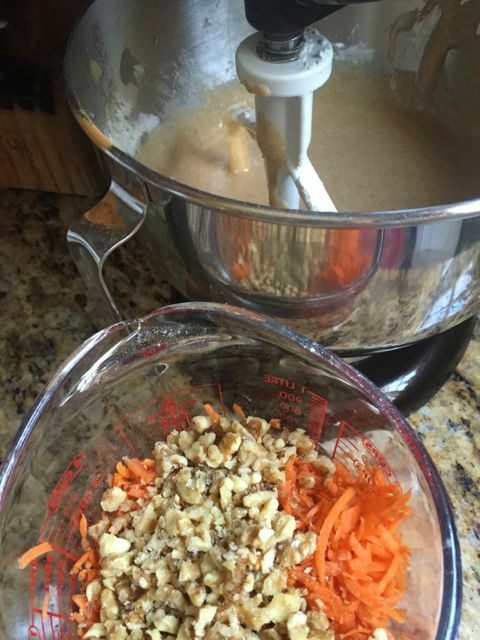 Stir in the carrots and nuts. Divide batter into prepared baking pans and bake for about 30 minutes, or until toothpick inserted in the center of the cake comes out clean. Let cakes cool in the pan for 15 minutes, then turn out onto wire racks to cool completely. Add butter and cream cheese to the bowl of a stand mixer and beat until creamy. Add vanilla and salt, beat to combine. Spread frosting over the top of one layer of the cake, then top it with the second layer of cake. Spread frosting over the top and sides of the cake. 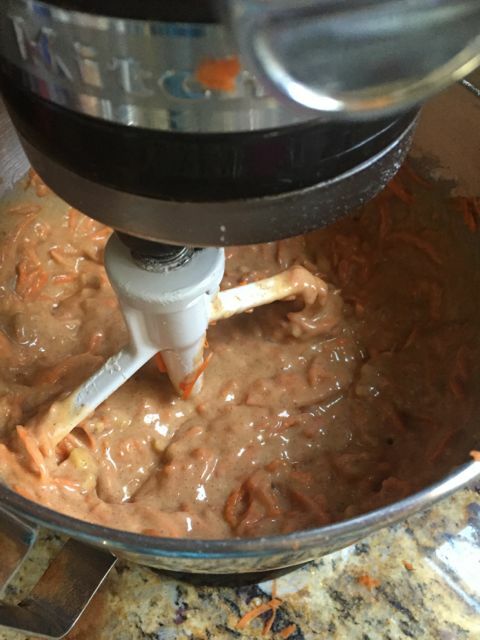 What do you add to your Carrot Cake recipe? Other Great cake recipes you might enjoy. Carrot cake has always been one of my favorites! I love how easy this recipe looks to make, I am definitely going to have to try making it soon. I LOVE carrot cake. This recipe looks amazing too. I have done something similar for pancakes – minus the frosting. I have a friend who loves carrot cake. I will have to share this with her! 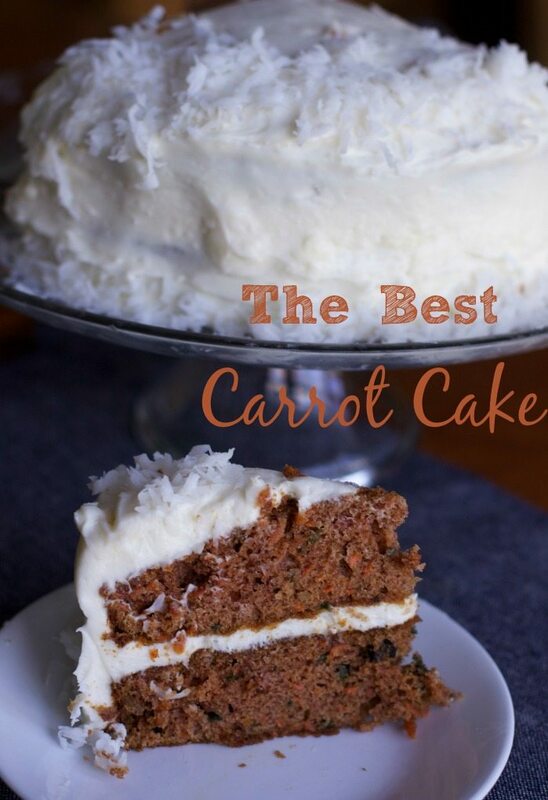 I have never made a homemade carrot cake, but it looks so simple to do. Maybe I will test out this recipe this weekend. The finished cake looks really delicious. I happen to love carrot cake. I can’t get anyone else to like it….so perhaps I will take your awesome recipe and make cupcakes. More for me!! Carrot cake might be my fave kind of cake other than cheesecake. I only make one once or twice a year but this recipe looks tempting. I love adding tons of carrots to up the nutritional value. This cake looks beautiful and delicious too! I love a good carrot cake and am going to save this recipe!